Esa es la conclusión a la que llega el corresponal de AP, tras hablar con algunos deportistas y reponsaables de las diferentes modalidades de pelota vasca que están participando en los Juegos Panamericanos que se celebran en Gudalajara (México). Llama la atención que, al igual que al corresponsal de canadiense National Post, a Stephen Wade, el corresponsal de Associated Press, le ha impresionado la fuerza, e incluso, la dureza de ese deporte. Así como la complejidad del mismo. Cricket is sure to stump a Chilean. Argentines are unlikely to understand American football. Baseball is bound to confound a Russian. And don’t expect a Greek to get the intricacies of golf. But, hey, they’re all easy compared to Basque pelota, a vast array of court sports played by pounding a ball against a wall with a bare hand, paddle, racket or basket. 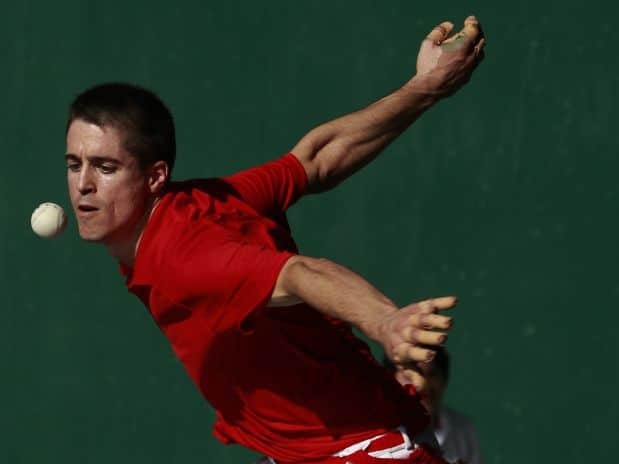 The barehanded variety is the essence of the sport, which has its roots in the Basque provinces of southwestern France and northern Spain but is part of the Pan Americans Games in Mexico. And it’s also the one that can cause the most pain.